How much do you know about nutcrackers? German-made nutcrackers are figurines or wooden dolls traditionally made to resemble toy soldiers, royalties, miners, and tradesmen. They are hand-painted using bright colors and they come in different sizes. According to tradition, nutcrackers represent strength and power, and they are symbols of good luck and goodwill. The nutcrackers are believed to serve as trusted watchdogs that scare away bad spirits. Back in Germany, in the heart of the Ore Mountains, tin and silver deposits began to decline. Miners must search for alternatives in order to feed their families. Since there are a lot of trees available in the region, they took the route of wood carving. There is also a theatrical ballet performed for German nutcrackers. The holiday season is not complete without the sweet treat of going into a show of “The Nutcracker Ballet.” Many people might remember the lights dimming in the theatre as Tchaikovsky’s score fills the air. The colorful journey of Clara with her magical toy soldiers, larger-than-life sceneries, and sparkling mischievous mice can bring the Christmas magic into the air. The Nutcracker ballet was inspired by E. T. A. Hoffman’s story entitled “The Nutcracker and the Mouse King.” The very first premier of the ballet was performed in Saint Petersburg on a Sunday, December 18, 1892. Hoffman’s story begins with Marie and her brother Fritz. They were given dolls, castles and a nutcracker by their godfather Drosselmeier who is an inventor and a clockmaker. On a Christmas Eve, when Marie prepares to go to sleep, she noticed that a lot of mice came out from the under her floorboards. These mice include a seven-headed Mouse King. A battle ensued between the mice and the dolls. The Nutcracker commanded the dolls in order to defeat the mice. The mouse king’s mother cursed the nutcracker to be ugly. The only way to lift the curse is for someone to accept the nutcracker no matter what he looks like. In the popular ballet and in Alexandre Dumas’ version, Clara is used instead of Marie. Clara is the one who fell asleep and dreams about a nutcracker prince. The ballet for Nutcracker came from the adaptation of Alexandre Dumas pere called “The Tale of the Nutcracker”. The Nutcracker ballet without the Russian composer Pyotr Tchaikovsky would be incomplete. Tchaikovsky composed the Op. 71 Russian Shchelkunchik ballet which was first performed in 1892. The composer used the instrument celesta which has a bell-like tone and an ethereal ambiance. Celesta compliments the voice of the Sugar Plum Fairy perfectly well and the instrument was acquired for the performance. Small scale but perfect. A lot of care and love goes in to making good quality products that will last and last. For the past 80 years this principle has underlined the artistry and workmanship at Christian Ulbricht GmbH & Co. KG. Have a look at our website and see how we turn wood into art in our workshops. In 1928, Christian Ulbricht‘s father founded the company „Otto Ulbricht‘s workshop for fine wooden crafts and toys“ in the small town Seiffen, in the heart of the. Ore Mountains. His success was built on entrepreneurial skills and a remarkable inventiveness. At the height of his career, Otto Ulbricht was awarded at the World Exhibition in Paris with a gold medal for his children’s room clock designs, and a group of Kurrende singers. After World War II and the dispossession of the Communist government resulted in the end of the company in Seiffen, now in the Communist East, Otto Ulbricht and his family were forced to flee to West Germany. It was in the village of Lauingen on the Danube River in Bavaria, that he re-established his Company, and eventually handed over the management to his son Christian Ulbricht in 1968. After Germany was reunited in 1990, Christian Ulbricht bought back his father‘s original company in Seiffen. With a lot of passion and diligence the family and their team create traditional wooden art that brings joy to grown-ups and children alike. And in every single piece the spirit of Christmas is alive. You might have seen the ballet and know the history where the nutcracker has started. You might be compelled to buy a nutcracker when you see some in a Christmas display on Costco and Walmart. There remains one question in your mind. Do Nutcrackers really crack nuts? This brings us to the subject of Steinbach nutcrackers. Removing the hard shells of walnuts, pecans, almonds, and chestnuts can be a lot of work. In order to taste the soft fleshy seed, the ancient people used big stones to crack the hard shells. Then came the Steinbach family of Artisans who helped solve one of the world’s complicated problems. Erwin Steinbach, the head of the Steinbach family started to carve woods in 1284 to create practical use items. Life can be tough in the regions of Erzgebirge. Miners work from dawn to dusk and endure a lot of hardships. After working hard, they can just watch in dismay as their fruits of labors are taken away from them by powerful soldiers and kings. The nutcracker dolls were designed after church leaders, kings, soldiers and police officers because the town’s people enjoy looking at the caricatures of their rulers doing the lowly task of cracking nuts. These symbolized the common man crushing the ruling class by forcing them to crush the nuts for the common man’s consumption. The nutcrackers can crack nuts if you lift a lever at the back of the figurine. The lever creates a strong force to crack the nut’s outer shell. The 17th-century design applies gradual pressure to the shells somewhat resembling a vise. They are called screw nutcrackers and the lever avoids damaging the kernel. For almost two centuries, the Steinbach family has produced a lot of nutcrackers, and ornaments. After a series of wars that ensued, the family settled in Germany’s Erzgebirge which was a mining area at that time. The family was then forced to return to the woodworking craft industry because the supply of gold, tin, silver, cobalt, and uranium dwindled. Herr Steinbach depicts characters from German legends and folklore. Steinbach did not limit the characters inside Germany. He used different characters from all over the world which was his greatest innovation. Steinbach’s mastery of his craft and his superb craft quality helped boost the nutcrackers’ reputation as a treasured collectible item. The wood carvings were readily accepted by the people as a new trade in the 15th century. It became popular because woodcarvings were used as religious symbols, gifts, and souvenirs by the tourist that came to the area. How did the Nutcrackers become popular in the US? 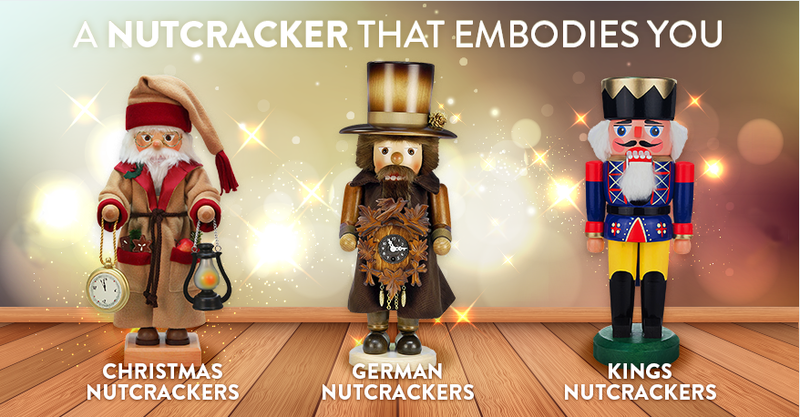 The nutcrackers have authentic costumes, whimsical expressions, and enigmatic charms that are unrivaled by other figurines. Although many stories and traditions are tied to it, they only became popular in the United States about a century ago. GIs or Government Issues who were stationed in Germany during World War II happened to go into an open-air market. It is in these markets that they were first gripped by the magic of nutcrackers. They sent them as gifts to their loved ones who are praying for their safeties at homes. The GIs thought that they have brought home a powerful figure which can ward off evil spirits from their owners. The rich heritage and tradition of nutcrackers arrived in the United States and has stayed there for a long time. The Lynden wood is commonly used for the body of nutcrackers. Lynden wood is common because it is lightweight and it’s easy to carve. The wood color is also pale enough to mimic the skin. A multi-blade circular saw is used to cut wood used for the body parts. Square wood blocks are used as nutcracker torsos. A machine called a planer is used to form the blocks into an octagonal shape. A saw is used to cut the octagonal into a torso-length piece. A conveyor feeds the octagonally shaped blocks into an automatic multi-station machine that shapes the torso. Then the wooden torsos go into a vertical router which cuts a notch for the lever which is used to open and close the nutcracker’s mouth. The next step is a drilling machine. It drills holes where the other body parts will be attached. The lever’s axle will also be attached to the drilled holes. The coat is created by staining a dark color on the wood. Once the stain dries, two coats of semi-gloss lacquer are sprayed. Every nutcracker stands on a wood base. The wood base bears the company’s logo. This logo can serve as a mark of authenticity for most of the nutcracker collectors around the world. The lathe machine is used in shaping the nutcracker’s head and torso. Then with a steady hand, the wood is hand-painted. The techniques which were handed down for many generations are still used in painting the nutcrackers. No two nutcrackers are alike because each piece is carefully hand painted. After the decorating, the coat with buttons and buckles, the head of the wood is drilled in order to attach the hair. The Nutcracker is then topped with a hat or a crown. This is the final step in making nutcrackers. 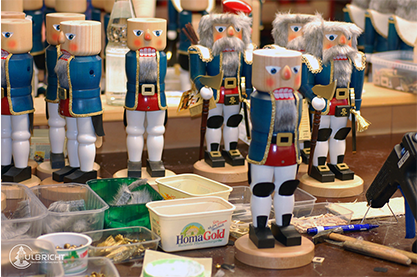 Many of the steps involved in making a nutcracker are still done painstakingly by hands. The small components including fur-trimmed caps and beards are carefully glued into position. Although many people will use their Christmas nutcracker as a decoration, it will still be an honor to the ancient people if you use your nutcracker to crack nuts. It can be difficult to find an authentic German nutcracker. Some people search for nutcrackers for sale at flea markets or antique shops hoping to find an authentic Christmas nutcracker. You can buy high-quality dolls from respected companies such as Ulbricht, Kurt Adler, and Steinbach. A nutcracker is valued and deemed collectible based on its age, rarity, craftsmanship, material and brand name. It should also be able to crack nuts as a proper nutcracker should do. 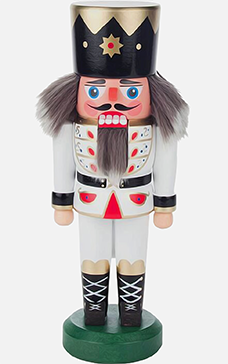 You might find yourself lucky if you are able to get a classic German Erzgebirge nutcracker. These nutcrackers have big angry mouths and grim looks. As mentioned, nutcrackers served as the caricature of rulers. When Napoleon Bonaparte conquered Germany, Erzgebirge produced Napoleon nutcrackers. Even the famous chancellor Bismarck was portrayed. The Christmas nutcrackers are sold and introduced to the local markets by Steinbach GmbH Marienberg and Christian Ulbricht. By limiting the number of nutcrackers that these companies produce, they have made the nutcrackers to be attractive collectibles to many enthusiasts. Some collectors even have over a thousand collectible pieces today. According to the late Herr Steinbach, “nutcracker serves as a symbol of happiness and protects your family from bad spirits.” You should have at least one authentic German nutcracker inside your home for good luck. What is the Best Brand for Nutcrackers? The easiest answer to this question would be Steinbach. Steinbach has been making German nutcrackers for 200 years. The industry still treats them as the finest maker of nutcrackers in history. The company is still located in Erzgebirge or Ore Mountains in order to have easy access to high-quality timber. What is the theme of your collectibles? You should start a nutcracker theme that will bind all your figurines together. Ask yourself whether you are buying nutcrackers for a certain age. If you want you can buy nutcrackers according to your child’s age every year so that you can track their growth. Most people buy nutcrackers not because of the good luck it brings but for more sentimental reasons. You also have to form a unity with the nutcrackers. They might have to wear specific decor, or they can come from a single manufacturer. You can do research about the theme and ask experts on how to put the perfect German nutcrackers or Christmas nutcrackers together. Why are some of the Nutcrackers Expensive? It can be a surprisingly long operation in order to make a long-lasting nutcracker. What is the reason for the purchase of Nutcracker? Although the main function of nutcrackers is to crack nuts, modern designs are usually built for decorative purposes only. You may want to crack a nut or two on an antique nutcracker but it’s not recommended nowadays. Even though authentic German nutcrackers can still crack nuts, don’t use them solely for this purpose. You can preserve their designs and make them a collector’s item. Society has moved to a less work and quick reward way of life anyway. Machines are the one shelling the nuts because people can’t be bothered anymore with the effort of cracking the hard shells of nuts. If you have hard to crack pecans, you might be better off in delegating the responsibility of cracking the nuts to a modern tool. Does the Value of the Nutcrackers Increase? The simple answer to this question is yes. If you have a collection of nutcrackers from a premier company like Steinbach, you can be assured that the value will increase over time. Steinbach makes nutcrackers in limited supplies. The rarer your nutcracker and the more difficult for it to obtain, the pricier it will be. That’s why centuries-old nutcrackers are considered to be an asset. German nutcrackers have become a staple for the holiday seasons not only in the German culture but all over the world as well. If you want to know where you can buy authentic Christmas nutcrackers, you can browse through the many stores on the internet today. You can also sign up for newsletters and updates on company websites in order to compare the prices for the holiday season. Now you know the history of German nutcrackers, you can also go to theatres and broadways in order to watch “The Nutcracker Ballet”. Send them as gifts to your loved ones. Decorate your Christmas trees with nutcrackers. And most importantly, you should enjoy the holiday seasons. 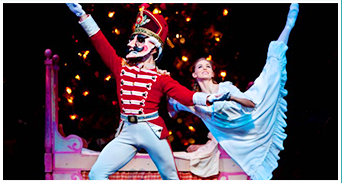 German Nutcrackers and The Nutcracker Ballet. A personal story about how I celebrated holidays when I was a kid and how I fell in love with my first nutcracker. Learn the connection between nutcracker dolls and the famous Nutcracker Ballet.